More than 1,000 young pilgrims will share their cultures, joys and struggles at a gathering of indigenous youth in a small town in Panama just before World Youth Day in January. The gathering will take place Jan. 17-21 in the Ngäbe territory of Soloy, in the Diocese of David, in western Panama. “This will be an encounter with the Lord through our culture,” Emilda Santos, 20, who is Ngäbe and one of the event’s coordinators, told Catholic News Service. The gathering will take place Jan. 17-21 in the Ngäbe territory of Soloy, in the Diocese of David, in western Panama. Fitzgerald, 48, has worked in the Soloy mission parish since 2007. On May 26, two men presented themselves for the next step in their journey into service to the marginalized of our world in the context of the Eastern Province of the Congregation of the Mission. They began their journeys because of the joy they observed in the lives of two Vincentians, Fr. Vince Finnerty and Alfonso Cabezas, Bishop emeritus of Villavicencio, Colombia. Our confrere Bishop ordained the men as deacons, imposing hands on them and handing to them the book of the Gospel they are to preach and serve. “Here I am Lord,” one of the most popular hymns, Catholic or Protestant, in the English language, captures much of the meaning of the day. Based on Isaiah 6:8 and 1 Samuel 3, it captures the age-old elements of the call and journey to service — fear and excitement, confusion and courage. Leo, originally from Cholula Puebla, Mexico, a state in the highlands of south-central Mexico, spent most of his young life living in and working in Charlotte, NC. In 2014, he first encountered the Vincentians through Father Vincent Finnerty, CM, an active Vincentian priest at Tiburcio’s parish. Leo felt drawn to the work he witnessed Father Finnerty undertaking in the community and the happiness Father Finnerty exuded daily. What he witnessed and experienced in his local parish was different from anything in his past. Every Sunday he felt struck by the Masses and a calm sense of peace remained inside of him. A friendship grew between Leo and Father Finnerty, who invited Leo on a retreat to meet the other Vincentians. Leo reflects on a time when Father Finnerty told him that God wanted something else from him. Soon after, in 2009, Leo decided to follow this calling and moved to New York to enter the seminary. Leo admits he felt scared to leave behind the life he had always known in North Carolina but reminds others that even when you have fear, God will help us overcome those scary moments. 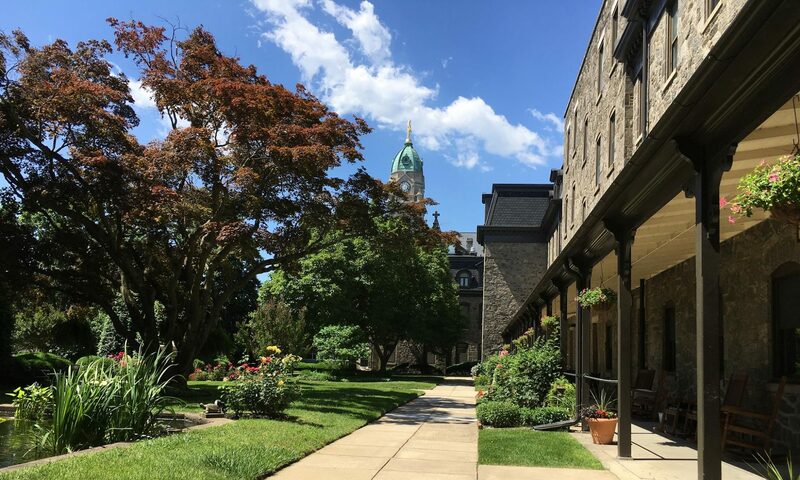 “In the end, we find ourselves gaining something much more than we ever imagined.” Leo has found peace and happiness in the seminary, and, although fear creeps in, he finds excitement as he embarks on the next step of his vocation. He finds joy knowing he will be returning to Charlotte, NC, which will give him the chance to give back to a community from which he learned so much while growing up. Luis Romero grew up in a small town in El Salvador, and from a young age knew the religious life was for him. As a boy, Luis would see the joy that overtook his community when priests visited and said Mass. When he saw this happiness he knew he wanted to bring that same joy to others throughout his life. In 2007, his family moved to Uniondale, NY, where Luis met Bishop Cabezas, a Vincentian who currently resides on Long Island, and celebrated the Spanish Mass that Romero regularly attended. Luis, drawn to the Vincentian lifestyle, decided to enter the seminary in New York in 2018. If this journey of service interests you, we invite you to lend your time, talent or treasure the Congregation of the Mission Eastern Province by contacting this website. I used to dread preaching on Trinity Sunday. Now I look forward to it. I grew up in an age where the most famous theologian of the last century, Karl Rahner, wondered whether, if the Trinity were removed from our vocabulary, would anyone even notice? I also remember being mystified by the question “Should I pray to Jesus, or to the Spirit, or to the Father?” When I first faced that question a half-century ago, I already had my head filled with the sophisticated theology one learns in the seminary. Now I was being asked a “heart” question. That question got me thinking. Who did I pray to? But I have a new problem. My mind spins with so many things to say and my heart overflows with the realization that we are made in the image and likeness of a God who is revealed to us as a community. There is so much I want to say. But let’s see what some popular writers have to say. What an incredible gift. What an incredible responsibility. Just think of what that simple gesture of the sign of the cross means. We touch our hearts for the Son – the one whose unceasing love took him to the cross, and the one who taught us, as well, how to love through his own Sacred Heart. Just these three sentences provide inspiration for at least three homilies. With the last sentence, think of Vincent asking us to love God with the strength of our arms. When we make the sign of the cross and pray the sign of the cross with those words, we make of ourselves an offering and a prayer. We embody what the Trinity represents. And we seek to bring that with our lives and with our actions to all those we meet. We do it in the name of God – all that He is, all that He does. What if we were to live the mystery of Trinitarian communion rather than just puzzle about it? Do we realize living the mystery of God as a communion of persons has the potential to change everything? This post originally appeared on the FamVin website. Our Superior General, Father Tomaž Mavrič, CM, acting in his capacity as President of the International Vincentian Family, inaugurates the “Here I am” initiative of the Vincentian Family. This initiative is close to the heart of our Central Association of the Miraculous Medal with its purpose of spreading devotion to Mary and supporting vocations. With hearts full of gratitude for last year’s 400th Anniversary of the Vincentian Charism and as we begin its fifth century, we are very much encouraged that each member of the Vincentian Family, as well as the Family as a whole, becomes more and more engaged in the life of the Church and the world. One very clear sign of commitment and vitality is the different initiatives in which we are involved and in which we encourage others to take part. The Vincentian Marian Youth Association (VMY), one of the branches of the Vincentian Family, is beginning 2018 with, among other things, the initiative, “Here I am,” to strengthen in every possible way the existing VMY groups around the world, as well as to become more active members within the Church and in the world. This active involvement and engagement in the countries where the Vincentian Marian Youth is already present surely will encourage others – parishes, schools, youth in different areas of society –to form new VMY groups in the given country, as well as to found Vincentian Marian Youth groups in countries where the VMY is not yet present. 2. to found groups of Vincentian Marian Youth in countries where the VMY still is not present. To Jesus through Mary: During the apparitions to Saint Catharine Labouré, Our Lady expressed this very clear wish, “I would like an Association of Youth founded!” This wonderful and extraordinary invitation and wish came from Jesus and Mary themselves. For us, this invitation and wish become nothing less than a clear sign that we must do everything possible to make Jesus and Mary’s invitation and wish a reality in the places and countries where the VMY already exists by founding new groups and by introducing VMY into countries where it is not yet present and founding it there. The International Secretariat of the Vincentian Marian Youth, which has its headquarters in Madrid, Spain, has prepared a project to help found new groups of Vincentian Marian Youth in as many countries as possible. The international team of the VMY Secretariat is available to any Congregation, school, parish, or young person in other parts of society who would like to know more about the VMY Association, receive materials, guidance, and help in founding and accompanying a new group. You can write its members there in many different languages. The Director of the VMY International Secretariat, Father Irving Amaro, CM, will send you a letter shortly with the details of the project. I would like to ask the Superiors General and through them the Visitatrices and Visitors of the different Congregations within the Vincentian Family, who decide to found a new group or groups of VMY in a given country, to name a sister, priest, or brother as coordinator. They then should inform the Director of the VMY International Secretariat in Madrid, Spain, so that he can help the newly appointed leaders to organize the new groups. I encourage and invite all of us, as members of the Vincentian Family, to do everything possible so that this initiative will bear much fruit and bring, God willing, many new vocations to the consecrated life. Let us place this project in the hands of Divine Providence through the intercession of Our Lady of the Miraculous Medal. I know this is a Veteran’s Day story rather than a Memorial Day story. I know Memorial Day is for those who made the ultimate sacrifice. I know that Veterans Day is for all those who served and came home. But I can’t hold it in until next Veterans Day. So I will write a Memorial Day story about those who came home. Those who are still paying a price we can not imagine. A price that is almost worse than a life snuffed out. A living hell made worse because they were told not to talk about their experiences. Just “Move on with your life” they were told! This weekend I was privileged to hear a 20 year veteran of surgical nursing in the military share the experience of the worst 13 months of his life. It has been almost ten years since that tour of duty at a Forward Operating Base in Afghanistan. After much therapy, he is grateful that he can sleep 19-20 hours per week. Grateful because for many years he was only sleeping 10-11 hours per week. I am amazed he can function in his place of employment! With great reverence, he shared slides, at times quite graphic. Some slides showed “wounds” (I am not sure that is the right word) that I had never imaged existed or that I would see. Some slides reminded him of the lives that couldn’t be saved. Other slides showed the pride of lives saved, even if not restored. With great reverence, he identified the pictures of the team that shared the experience of those 13 months. He told their stories also. Memorial Day and Veterans Day will never be the same for me. I must admit that, as so many people, I had come to think of Memorial Day as the beginning of summer. Not anymore! All this reminded me of the glimpses Vincent had of the suffering of the poor in his time. Besides some brief and short-lived periods of peace, the century in which Vincent lived was a century of war: People, soldiers and non-combatants, suffered the consequences of the wars of religion and the upheavals of the civil wars which were often complicated by foreign wars and continual threats from the Muslim world. We must also admit that our century is no better than the seventeenth century … in fact we have surpassed the horrors that were created by the Thirty Years War and the Fronde. There are Christians and disciples of Saint Vincent on both sides of every barrier, wall or “curtain”. Like Vincent, they participate in countless endeavors to alleviate the suffering that results from war. These individuals seek to discover the root causes of war and yet do not embrace a blind pacifism. They support other organizations that promote, on both a social and political level, peace and justice in the world. The disciples of Saint Vincent always defend the poor and are also concerned about establishing peace because they realize that the poor are often the first victims in all of these various conflicts. This surgical nurse is not the only one with so much of an untold story. One of the ways they are now being helped is through Prolonged Exposure Therapy. People with PTSD often try to avoid things that remind them of the trauma. This can help them feel better in the moment, but in the long term, it can keep them from recovering from PTSD. When the parades have passed by what we can do? Do we recognize the existence of these untold stories in our midst? Are we ready to listen if we sense a need to talk? Please pray for Helen Slusark, Fr. Steve Grozio’s Aunt and Godmother, who is in the hospital in critical condition. Por favor oren por el Helen Slusark, la tía y madrina del P. Esteban Grozio. Ella esta en el hospital en estado crítico. French Jesuit Pierre Teilhard de Chardin said that the discovery and harnessing of fire was one of the great technological discoveries of human history. I was struck by how the Rev. Michael Curry spoke of fire in his homily at the royal wedding. Fire made it possible to heat warm environments and thereby marking human migration a possibility even into colder climates. Anybody get here in a car today? An Automobile? Nod your heads if you did, I know there were some carriages. Those of us who came in cars, the controlled-harnessed fire made that possible. I know that the Bible says, and I believe it that Jesus walked on water, but I have to tell you I didn’t walk across the Atlantic Ocean to get here. Controlled fire in that plane got me here. Fire makes it possible for us to text, and tweet, and email, and Instagram and Facebook and socially be dysfunctional with each other. Fire makes that possible, and de Chardin said fire was one of the great discoveries in all of human history. He (Teilhard de Chardin) went on to say if humanity ever harnesses the energy of fire again, if humanity ever captured the energies of love, it will be the second time in the history that will have discovered fire. Dr. King was right. We must discover love, the redemptive power of love. And when we do that, we will be able to make of this old world a new world. My brother, my sister, God love you, God bless you. And may God hold us all in those almighty hands of love. I believe this is the dream in the heart of every missioner in whatever state of life. If you have this fire we invite you to lend your time, talent or treasure the Congregation of the Mission Eastern Province through this webpage. A snap quiz! Name the seven gifts of the Holy Spirit. 1831 The seven gifts of the Holy Spirit are wisdom, understanding, counsel, fortitude, knowledge, piety, and fear of the Lord. In recent weeks I have been thinking a lot about some other forgotten truths… forgotten truths about Vincent. The truth is that he was humble enough to ask others to help. He was not wedded to any messianic delusions, tendencies of thinking that he had to do it on his own. The truth is that he was adept at involving others in what he saw needed to be done. He found his strength in accepting his limitations. He was all about networking for the sake of the mission! These seven gifts help us to respond to the presence of the Holy Spirit in our lives, to make good choices, and to serve God and others. Wisdom is the gift of knowing the right choices to make to live a holy life. Understanding is the gift helps you be tolerant and sympathetic of others. It helps us sense when someone is hurting or in need of compassion. Reverence, or Piety, is the gift of confidence in God. This gift of reverence inspires us to joyfully want to serve God and others. Come Holy Spirit! Fill the hearts of your faithful – followers of Vincent and Louise. Send forth your spirit and they shall be created – so that love lights up our mortal frames until others catch the living flame. Grant us in the same spirit to be truly wise – knowing that others share our vision and be humble enough to ask for their help so that together we may be set on fire. And ever rejoice in his consolation through Christ Our Lord. What means are to be employed and what dispositions are necessary in order to participate in the reception of the Holy Spirit. Fr. Pat Griffin of the Eastern Province of the Congregation of the Mission offers insights into the in-between-time of our lives. We sometimes refer to that period which is sandwiched between two events as an “in-between” time. The occurrences which flank this interval often provide its character and purpose. The unifying force of the interlude draws the two poles together in a manner which gives direction to the whole. “In-between” time enables one to reflect upon the meaning of one happening and prepare for the next. It reminds us that we are always on a journey. Attention to this interval confirms where we have been and primes us for what is to come. It is like the silence between notes of music, the break between words in poetry, the rest between exertions. On occasion, I have been drawn to reflect upon some of the in-between times which the New Testament and the liturgical year offer to us. These are times about which we know little but which are defined by great events. Holy Saturday seems like one of those times for me. For the apostles, it is the time between death and Resurrection. One could also consider the time between the incarnation and the nativity; between the presentation and the beginning of the public ministry (with the story of the “finding in the Temple” offering a break); and so forth. This gift of the Holy Spirit would deepen the disciples understanding of Jesus and their ministry. The preparation for Pentecost was to give the community an opportunity to get themselves ready to change and be changed. I envision it as a time of quiet, openness and, perhaps, some eagerness. I think that this period may have had some particular importance for our Founders. We know the circumstances surrounding the lumière, and how it influenced Louise’s later thinking. This time of waiting corresponds to their willingness to trust in Divine Providence. I can think of many situations in my life where the gift of the Holy Spirit would be welcome. The current in-between time provides a chance to seek and accept. Come, Holy Spirit. After Saul of Tarsus was struck blind on the Damascus Road, God led Ananias to go and pray for him. He was then filled with the Holy Spirit, and from that moment on, he went out and proclaimed Christ in the synagogues. … their fidelity was great, profound, inspiring, deeper, larger, more consequential than they ever imagined. • burning for justice and peace and inclusion and wholeness and Christ’s love. This has always been and remains our charism and our mission; our place and our role in the Church; our sermon in the pulpit and on the city’s streets. Let love light up my mortal frame until other catch the living flame. There are already hundreds, if not thousands, of us already associated with the mission of the Eastern Province of the Congregation of the Mission. Whether in vows or as lay collaborators, we share in the mission of Jesus bringing the explosive good news of God’s love in word and deed. In the fifth century of the Vincentian Charism won’t you join us in sharing your time, talent or treasure? Over fifty years ago I distributed a memorial card on the occasion of my ordination. I thought it was a saying of Vincent. I have since learned it was written by Cardinal John Henry Newman. We believe in “community for mission”! Let us know if you are able to collaborate with us.